Social scientists have severed social problems from the study of framing work in social movements. This article proposes to rejoin problems and framing work via attention to the phenomenological structure of social problems. By describing basic 1) temporal, 2) spatial, and 3) experiential features of social problems, we facilitate comparisons of different kinds of movements across distinct historical periods and regions. The approach is demonstrated via the example of “slow violence” (Nixon 2011)—suffering that develops gradually across time and extends across space as well as disproportionately afflicts disempowered people. A comparison of two very different historical cases—environmental justice advocacy in the wake of the Union Carbide disaster in Bhopal, India and consumer activism in early twentieth-century America—illustrates how slow violence presents parallel issues with respect to representing the problem and identifying the culprits. On this basis, the argument demonstrates parallels among disparate social movements by including the analysis of the phenomenological structure of social problems into comparative studies of framing work in movements. As such, this article presents analytical possibilities for incorporating experiences of social problems into the study of framing work and social movements. I would like to thank Jeff Haydu for not laughing me out of the room as I developed the argument and for detailed comments on an early draft. I am also grateful to Michael Berman, Rick Biernacki, Jeff Guhin, Ian Mullins, Kelly Nielsen, Tien-ann Shih, and Sam Stabler for their generous and trenchant advice, even when I didn’t take it. 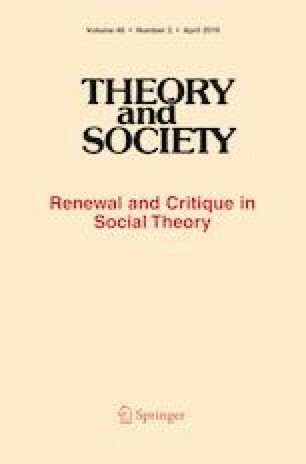 Finally, Karen Lucas, the Editors of Theory & Society, and several anonymous reviewers provided thoughtful recommendations for clarifying the argument.